Vivica A. Fox is a dynamo who has created a lasting career on her own, through sheer, roll-up-your-sleeves DIY hustle. Every Day I’m Hustling is a personal book with a message Fox passionately believes in: that you make your own luck, that you never ever wake up in the morning thinking somebody’s going to call you and offer you that part or ask you out on that date that’s going to change your life, that you have to wake up and put on your longest eyelashes and fiercest heels and go out and make your life happen yourself. The actress provides start-today strategies for success in business and “been there” lessons in love, buttressed with stories from her early family life all the way through to today. Always honest and always funny, Fox also tells behind-the-scenes tales from some of her biggest movies — such as Uma Thurman’s life-changing advice during Kill Bill and Will Smith’s downtime pep talk on Independence Day. 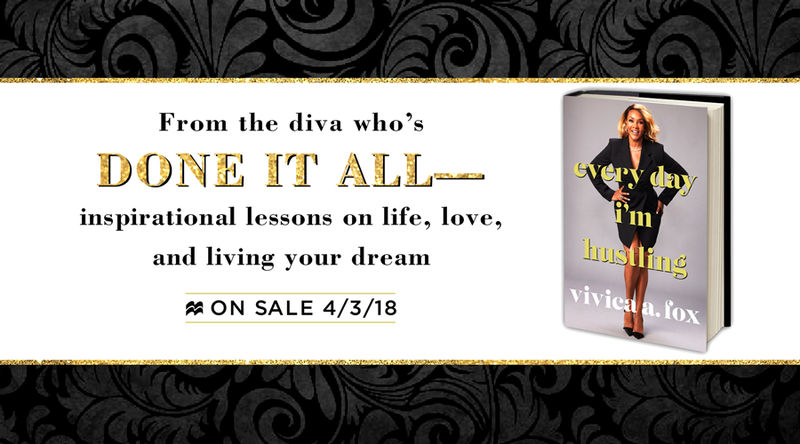 And she maps out exactly what it took to come back with a role on the smash hit Empire and her own frisky show on Lifetime, Vivica’s Black Magic. She also shares her how-is-she-53? secrets to looking your best, no matter the age on your driver’s license.